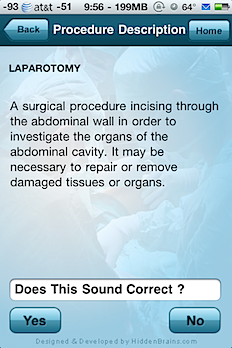 SurgAware is an app that is meant to be used as a tool by physicians and patients to increase the transparency of the decision making process before surgery. It provides a quick reference of general and specific risks for selected conditions with the goal of making the informed consent process more consistent and evidence based. While the goal is clearly laudable, the main drawback thus far is the limited numbers of procedures and specialties represented thus far. Searches are performed either by entering the name of the procedure or by selecting a specialty and drilling down to the procedure of interest. Specialties included are as follows: General, General – Endocrine, Orthopedics, General – Miscellaneous, General – Hepatobiliary. Application data is a hybrid between local and remote storage thus the application needs an internet connection to be fully utilized. SurgAware provides a novel approach to patient care by providing an electronic record of known general and specific risks for the procedure. For the procedures that are available, SurgAware gives key points of the known risks and complications. Before showing the risks, the software prompts the user to confirm that the procedure selected is the correct procedure. This is a nice touch to the program and helps ensure that the correct information is being transmitted. The clinician should keep in mind that the risks displayed may not be comprehensive. Nevertheless, the list can be copied and emailed out allowing the clinician to print the list or display it electronically for the patient’s benefit. The main weakness of this app is its very limited specialty and procedure list. Also, if an internet connection is not present, the application will be unable to load the procedures and provide information. There are also some grammatical errors in parts of the application, such as the error messages. Even on iOS devices with limited storage amounts, text data should be easy to accommodate and the need for server access impedes an otherwise well-conceived program. 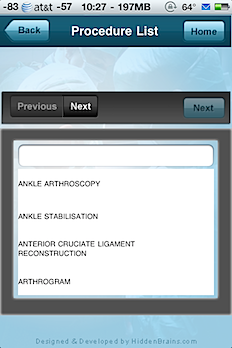 Another issue with the app is a limited number of procedures and specialties. Searching for a common procedure like “appendectomy” yielded no results, a definite surprise to this reviewer. The developer has contacted us with clarifications to the app’s functionality. Specifically, the following specialties are also available in SurgAware but not noted in the original review: General – Breast, General – Hernia, General – Skin and Soft Tissue, Gynae Obstetrics, Maxillofacial, Paediatric Cardiac, ENT, Neurosurgery, Urology, Colorectal, Upper Gastro-Intestinal, Opthamology, Cardiac, Plastic Surgery, Anesthesia. This software is available in Apple’s App Store (link) currently for $2.99. Testing Platform: This application was tested on a 32 GB iPhone 4 running iOS 4.0.1. Data access was provided over 802.11n Wi-Fi on a 17 Mbps/1 Mbps connection with a 24 ms ping as measured by Speedtest.net (http://www.speedtest.net). Editors note: this review originally had a star rating, but has since been removed. iMA will start offering star ratings of app reviews, but we are currently still analyzing our star rating system and will release star ratings only when we have a well defined rating system that is applicable to each application. Thanks very much for the review, and all points noted!! The appendectomy issue is one of ‘American’ vs ‘English’ procedure descriptions. If you enter ‘append’ for eg, the data is there – i.e. this is a limitation of the ‘search function. Our first upgrade will be a ‘direct to cache’ data load to speed up the system. Thanks again for the review – we’ve taken note!! We look foreword to the updated version ! We have over 300 procedures loaded – these must represent well over 95% of all surgical procedures performed. The big idea is to open debate on to what info needs to be included via the ‘comment’ function – whether as a doctor or a patient – we’d like to know what info is important!! To my knowledge, there exists no way to browse the complete database all at once as data retrieval is search-dependent or specialty-dependent. After reading your feedback, I have examined the database again and, as you indicated, I do find more specialties and procedures than I did upon initial review. I can only attribute this to possible problems in data access, network latency or another cause related to my iPhone test unit. My inability to find appendectomy was unusual but that issue having been explained puts the search in different context and your post indicates that this is now a non-issue. As the database does contain far more specialties procedures than I originally observed, I would easily upgrade the rating to 4 out of 5 and recommend a “Browse Complete Database” feature be added to future versions. Thank you for your replies and clarifications to the review of this exciting iOS application! Thanks, Brian, I appreciate you readdressing the issue. The decision to go web-based as an initial version was made so that we could very quickly add to and enhance the database ourselves based on comments received by either doctors or patients. I know it is inconvenient, but our intention is to have a cache version that avoids all the downsides of needing internet connectivity. The surgery itself is where poor pre-operative planning may come to light, but a surgeon performing an operation may also be negligent in his duty of care to the patient.